Looking for the ultimate white cheese dip? There are some people who are fanatic about this. Almost cult like, if you will. Some Mexican restaurants serve this and people are dying to get their hands on the recipe so they can make it at home. Now whether this recipe is that good, well, that’s up to you. I think you will be pleased. I know I got the consistency right. This is an amazing sauce in which to dip your chips. You can use it to top burritos, enchiladas, nachos and tamales. Vegetables like carrots, celery, and broccoli work well too. I rarely notice white cheese dip on restaurant menus that I frequent here in California. But it has none-the-less gotten my attention. Visitors to my website have been asking me if I have a recipe for it. Now I do. This recipe is often referred to by many different names. It is called queso blanco, mexican white cheese dip, TexMex cheese dip, or chili con queso. “And boy is it delicious”, they say. I started experimenting by melting the cheese in a double boiler and adding all the ingredients like so many other recipes say to do. That worked, sort of. But the cheese tended to get grainy and clumpy. Definitely not smooth and creamy like I’ve heard about. I tried different cheeses too, thinking it was the cheese. Teleme had a nice flavor but was way to grainy for my liking. Monterey jack seemed to work quite well in terms of flavor but the consistency would clump or separate. Asadero, sometimes referred to as Quesillo Oaxaca, which was hard to locate, seemed to be the cheese of choice. But the consistency wasn’t coming out right either. Just melting the cheese, any cheese just didn’t seem to get the results I was looking for. My goal was creating a dip that was smooth, creamy, and stays soft like the nachos you buy at a football or baseball game but with better flavor. Finally I discovered the technique to make the sauce that would give me the texture I was looking for. Because of this secret, you can use pretty much any cheese that melts reasonably well. Here are some cheeses you can try, Monterey jack, teleme, white or yellow cheddar, white american (land of lakes) and of course asadero and mozzarella. The French get all the credit. Instead of just trying to melt the cheese directly which really doesn’t work well, the French developed what is called a Bechamel sauce. This technique creates a white dip that is creamy, smooth and stays soft. Bechamel is one of 5 basic mother sauces originating of French cuisine. 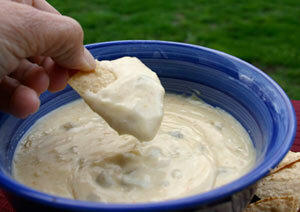 It works great for this creamy Mexican white cheese dip. And don’t get scared off by the fancy name. A bechamel sauce is really easy to make. Back to the Bechamel sauce. Not only is it easy, it will only take you a few minutes to make. First you start with a roux which is equal parts (by weight) of melted butter and flour. The mixture is whisked in a sauce pan over low heat until the flour turns into a paste. This is cooked for about a minute on low heat stirring constantly. If you cook it too long it will turn brown and you won’t have a “white sauce”. Your sauce also won’t thicken up as well either. Milk is then added and cooked until thickened. Then the other seasonings are added. The sauce is then removed from the heat and grated cheese is added and mixed in with a whisk. The cheese is gently melted which results in a creamy, smooth dip to die for. If you want to make a cheese dip/sauce that is mild but flavorful, just add one or two fresh chopped jalapeno without the seeds and de veined. Now if you want to spice it up a bit, I have found that adding some canned chipotle chiles, say one or two, finely chopped up, will start adding some kick. The chipotle chiles add a nice smokey flavor to the sauce. It will however start changing the color of your sauce from white to pinkish red, if that’s a concern to you. The good thing is that the color will make it easier for you to identify which sauce is which if you were to make both. So play around with this a little to get the desired hotness you are looking for. You can even omit the fresh jalapeno and opt for just some of the canned chipotle sauce without the pepper, for some smokey flavor without much heat. In a frying pan, saute onion in olive oil for 5 to 10 minutes over medium heat. Stir frequently to prevent burning. Add the garlic, reduce the heat to low, and cook for 5 min. Set aside. Have all your other ingredients ready to go. Grate that cheese, measure out that flour and butter. Chop up those jalapeno or chipotle chiles and measure out your milk. Having everything pre measured and ready to go into the recipe, will make things much more organized and easier for you. The first thing we are going to do is make a roux. Grab your 2 quart sauce pan and melt the butter over very low heat. We don’t want to see a lot of bubbles going on in melting the butter. Just a gentle melting. Once the butter is just melted, add the flour and stir with a whisk to blend it together. Turn the heat up just a little bit so that you can see the flour/butter mixture slightly bubbling. Stir constantly for 1 minute. Now add a little milk while continuing to stir with the whisk. Add the rest of the milk and turn the heat up to medium. Continue to whisk for about 5 to 10 minutes. You will notice the sauce getting thick. Turn the heat down just a little and add the cumin, onion and garlic mixture, the green chiles, and the jalapeno/chipotle chiles. Stir until well mixed and hot. Add a pinch of salt and pepper and stir. Turn off the heat and add the grated cheese, one handful at a time. Stir each handful in with the whisk until melted. Keep adding handfuls and stirring until all the cheese is mixed in and creamy. Now you get to taste it. Does it need more salt? More heat? You can still stir it in at this time. If you have one of those small crockpots or fondue pots, that would work well to keep this dip warm. Serve with tortilla chips. Makes about 2 1/2 cups.